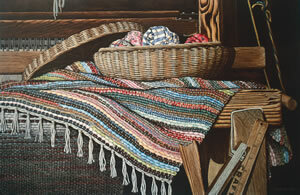 When I started my art career back in the 1980s, one of my earliest paintings was of a hand-loomed rug made by a remarkable 101-year-old lady named Sallie Parnell. Aunt Sallie, as she was known by thousands of people, touched many lives, not only through her rag rugs but also by her smile, her work ethic, her hope and perseverance. She lived her entire life in Tyro and made rag rugs on her 200-year-old loom. She would spend hours upon hours at the loom weaving. Her place of business was in the back of her house where she received customers/friends because if you were a customer, you were a friend. When you knocked on the door, she would say, "C'mon in." She never met a stranger. Aunt Sallie's mother taught her to weave when she was a little girl, and she did so up until her death. In trying to put Aunt Sallie into perspective it helps to remember that she was a woman of the '80s. Born in 1887, she lived her entire 107 years in the white, two-story frame house on N.C. Highway 150 in the community of Tyro here in Davidson County. The loom where she worked daily was built at about the time George Washington was inaugurated. The log barn behind her house was built by her grandfather before he went off to fight in the Civil War. Her father built the house where she lived just five years after Edison developed the electric light. Aunt Sallie's mother, Josephine, started teaching her to weave on the big, double harness loom that dominated one room of their home at about the time Teddy Roosevelt and the Rough Riders were making their charge up San Juan Hill. Man learned to fly and went to the moon while her shuttle passed countless times through the warp. Sallie Farabee married George Parnell the same year that World War I started in Europe. Sallie and George were farmers, but the income from the weaving helped to keep body and soul together through the Great Depression and the birth of three boys and two girls. The lowest point in Aunt Sallie's life came during World War II. The boys, Douglas, Terry and Frank, went into the service. Carolyn went into nurse's training, and Sarah stayed home to help on the farm. One day in 1945 she got a telegram that Douglas had been wounded in Germany. Just a week later she got another telegram that Terry had been killed in the Philippines. Later that year, a nephew, Major Thomas Farabee, released the atomic bomb on Hiroshima, and the war ended. When Douglas and Frank came home they only had a few months to get reacquainted with their father before he died in 1946. I saw in Aunt Sallie truths that are timeless, truths such as hard work. She came from a generation that worked hard just to get by. Weaving rugs was very hard work, and it took many hours just to finish one drugget (full floor cover) or stair runner but, for her generation, if you did not work you did not eat. Her perseverance was a character trait that showed even when she was much older and had to use a walker to get to the loom. 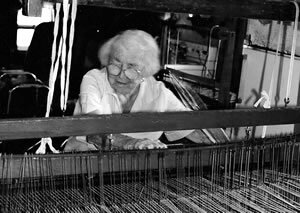 She kept weaving right up to her death at the age of 107. Aunt Sallie had a dry wit and sense of humor. I spent many hours just sitting, talking and laughing. I asked her once how she managed to live so long. She had heard that question many times, but she seemed to take a bit of extra time to answer me. Then she said, "Eating sweets," and I had to laugh. Her daughter, Carolyn, who lived next door and looked after her, had told me that it was an ongoing contest to try to find where Aunt Sallie would hide her chocolate or candy bars that people would bring to her. I cherish the rugs that Aunt Sallie made for me because they are the real things, not "authentic reproductions." I cherish them also because they bring back the memory of a wonderful little lady who lived her life to the fullest. And who knows, maybe eating candy is the way to a long and happy life.